Take a Look at This Jaw Droppingly Royal Wedding! Japinder wore one of a kind white gown on her engagement designed by Dar Sara High Fashion. 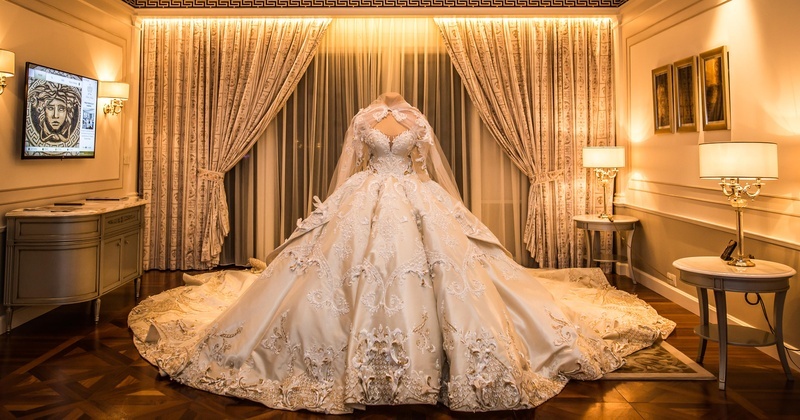 The gown is elegant and jaw dropping! Japinder and Harpreet had the most dreamy mehendi ceremony ever. It was held on a cruise overlooking the Dubai line. A helicopter showered 400kgs of rose petals on the guests. Harpreet wore Rohit Bahl while Japinder wore a green and yellow lehenga by Shaveta and Anuj. Her lehenga was adorned with 3-D peacocks and millions of sequins. It was a 20kg lehenga that the bride pulled off with utter ease! Ace designer Manish Malhotra sat with the bride to design a picture perfect, royal, elegant (we are running out of synonyms!) lehenga. Together they brought to life a deep purple sucha (pure) badla work lehenga in contrast with the deep maroon crown she wore. The crown is a Farah Khal Ali’s creation which was full of Rubies worth 175 carat. The trail of the lehenga is bejewelled with real Swarovski diamonds! Her chuda is a family heirloom made of real ivory and the kalire are pure gold! We still can’t get over Japinder’s look! The laavan or the main wedding took place in the early hours of the morning at a Gurudwara. And guess who officiated their wedding? The Head Granthi of Golden Temple, Akal Takht (biggest possible priest in Sikhs) in the presence of the full Chief Khalsa Diwan. As it was held early in the morning, Japinder chose a coral coloured sharara designed by Pakistan’s icon Faraz Manan. She was wearing real diamonds and real Burmese rubies. If we had even 1/4th of their money, we could make all our dreams come true! Jokes apart, Japinder got what she wished for. She wanted a one of a kind, elegant wedding and look how her wish came true! We wish all the happiness in the world to the newly weds!